The relationship of sisters Kelly and Olivia Van Gilder has been, well… complicated ever since their mother left them as teens, though it’s the secrets they have been keeping from each other as adults that have unwittingly widened the chasm. But one thing they do share is the not-so-secret torch they carry for the Martin brothers. In the small enclave of New Holland, Washington, Griffith and Ryan Martin were demigods. While Griffith was the object of Kelly’s high school crush and witness to her mortal teenage humiliation, Ryan was for Olivia the boy who got away-something she’s never forgiven Kelly for-and the only person since her mother who appreciated her wild streak. 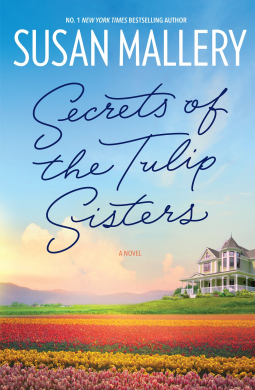 Secrets of the Tulip Sisters was a winning read for me. I really enjoyed the characters, the constant roller coaster ride of relationships between various people, and most of all the sisters themselves, Kelly and Olivia. Both girls hold secrets that the other doesn’t know and some of them could push them over the brink of never speaking to each other again! Olivia has just returned home after many years away. Their mother left them when they were young girls, just let me say… no one would want her for a mother and that’s for sure. I liked both girls and the journey they take as they renew their relationship, and reach out into romantic relationships as well. Olivia is a very organised person with a number of talents that see her making herself very useful to the people of Tulpen Crossing as she sets about showing them how they might improve their businesses. Its not long into the time she realises Ryan isn’t the one for her, however unbeknown to her Sven, the one she attaches herself to might be a time bomb waiting! Kelly has a best friend Helen, they are great mates, however Helen is falling for someone that is going to rock Kelly’s world. How will that work out? I wasn’t sure right to the last move, but it all worked out for the best in the end. I loved the job that Griffith had building tiny houses, and the tulip growing business that Kelly is so involved in. These combined with Olivia’s love of design and improving the appearance of her sister and others just sweetened this story. Griffith was a piece of work! He is determined to have a relationship with Kelly but no commitment or love, he was burned once in marriage and never again. Of course the man is living in lala land, he’s on the road even though he doesn’t realise it. His care and concern over Kelly is admirable and the lengths he goes to – superb. Especially with one difficulty that Kelly has that he deals with by some research and very straight talking. A wonderful, romantic story with that something extra that made it a delightful read. This sounds wonderful and I love when books have that something extra that makes it just a special read. I keep seeing so many wonderful reviews on this book. I've been eyeing this book. Thanks for sharing!